Date Ciphers and Factory Marks. 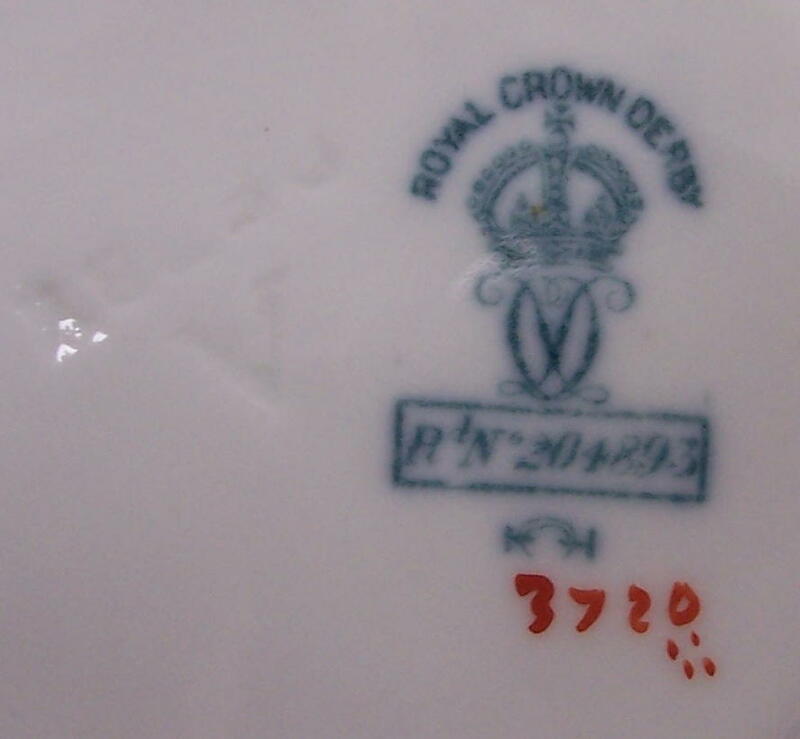 In this section I have included a selection of factory marks for the period 1927 onwards. This website deals only with ware from the Osmaston Road Works. 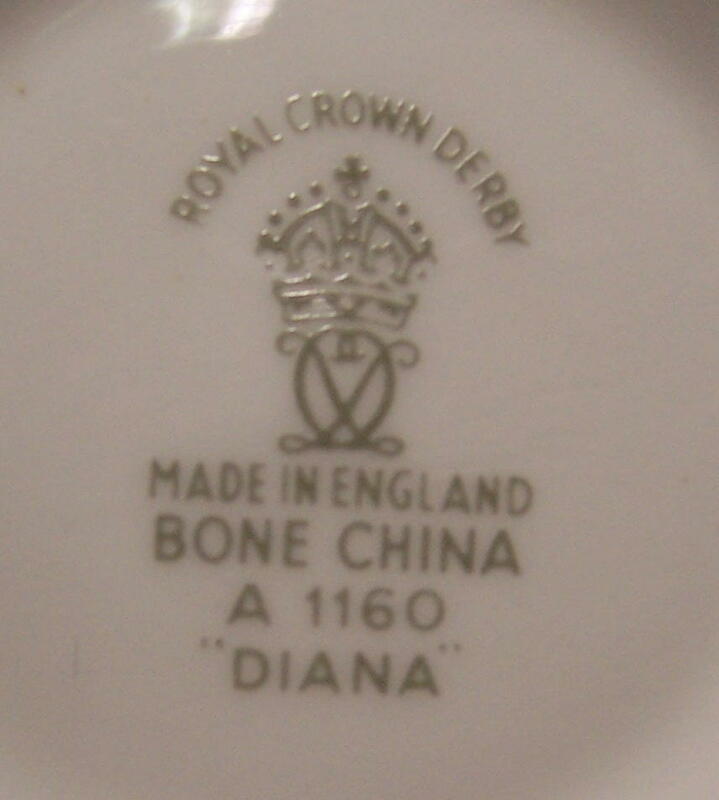 It should be appreciated the subject of date ciphers and factory marks in respect of Royal Crown Derby is a very complex one. 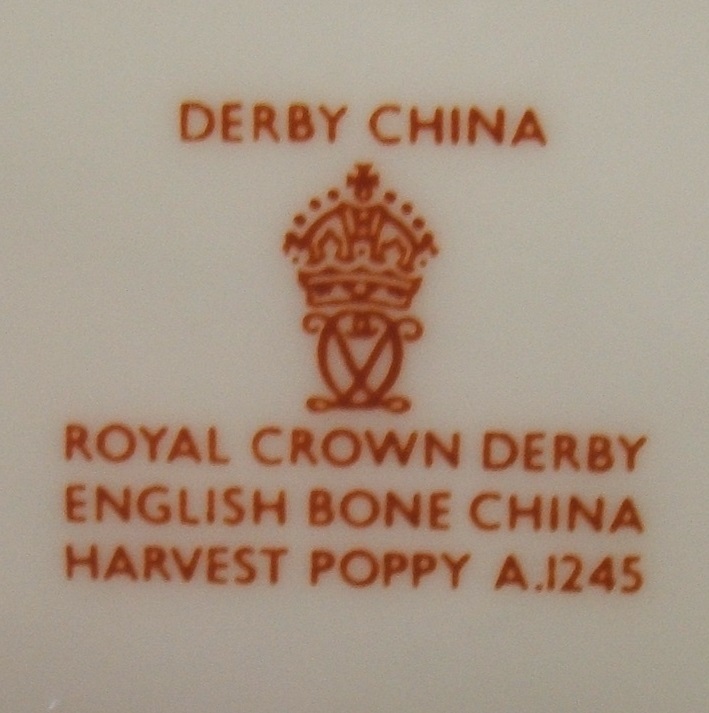 Anyone requiring detailed information on this topic is advised to read the excellent paper by Ian Harding in Journal 6 of the Derby Porcelain international Society 2009. Fortuitously I have only needed to concentrate on a 34 year period. I have endeavoured to give sufficient information to give a reasonably accurate date of manufacture. For the purpose of elimination, below is a selection of factory marks for the period prior to 1927, dated in accordance with date ciphers set out in the subsequent tables. The first image shows a back stamp used from 1877-1890. 766 is the pattern number. 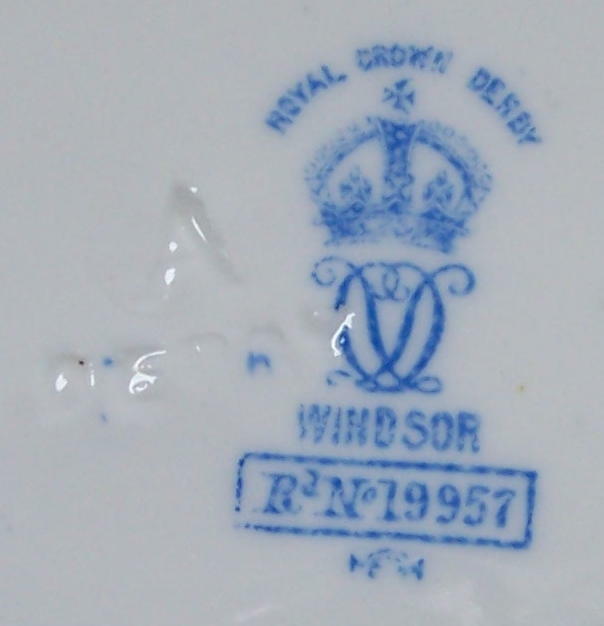 The diamond registration mark dates the piece to 1881. 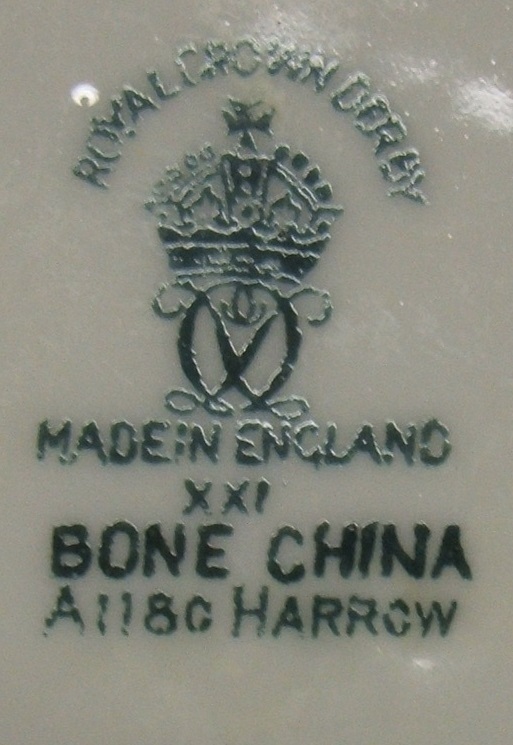 As a general rule, if the factory mark shows a vertical "ENGLAND", the piece was manufactured after 1890 and before 1923 and is not likely to appear in this website. There are however some exceptions. Patterns such as 1128, 2451 and "Mikado" were produced throughout the period, and will therefore appear with more modern date ciphers. Occasional anomalies turn up. Above is a coffee set. All pieces are marked A416, a design first entered into the pattern book in the 1930's. Most of the pieces have the factory mark for 1940. 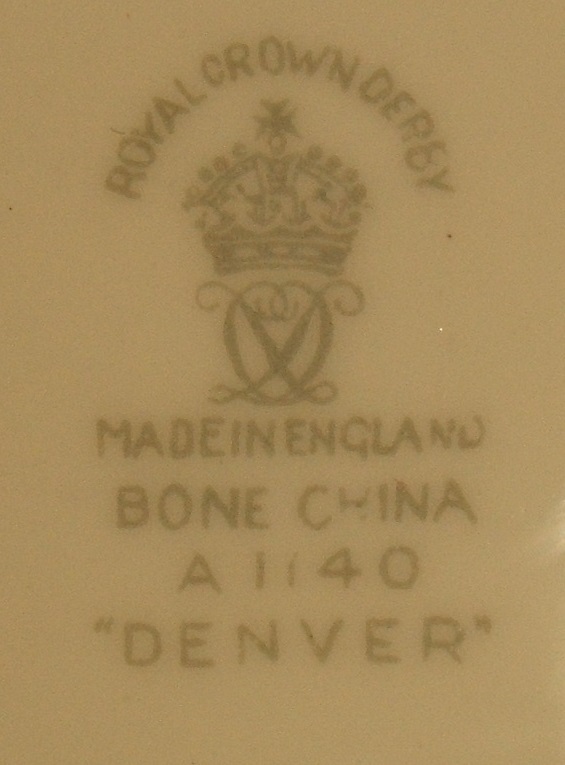 The sugar basin has a date cipher for 1914 and includes the vertical "ENGLAND" mark. 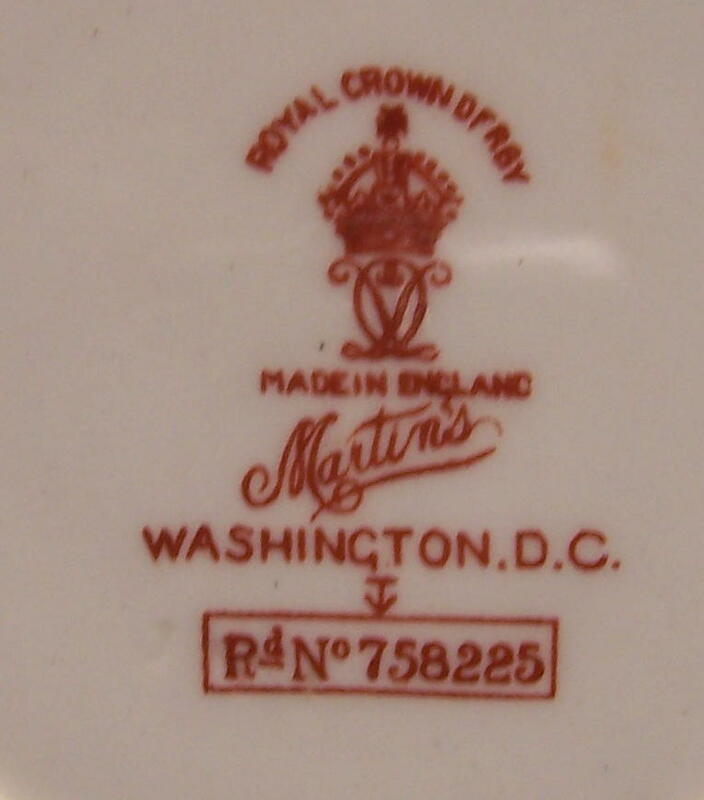 Ian Harding also includes images where factory marks include both the vertical "England" and the "Made in England" lettering. 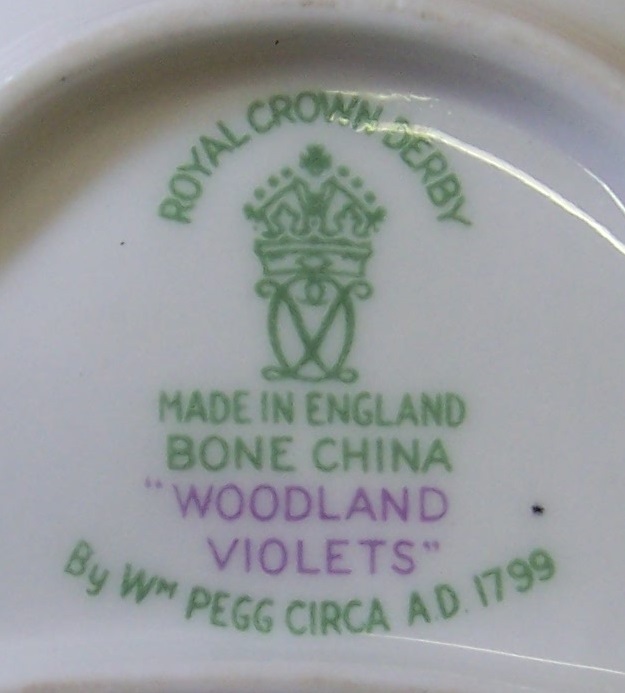 The "Made in England" is in a slightly different colour and seems to be a later addition. It seems most likely that pieces in storage were used long after they were originally potted, but further research is required. 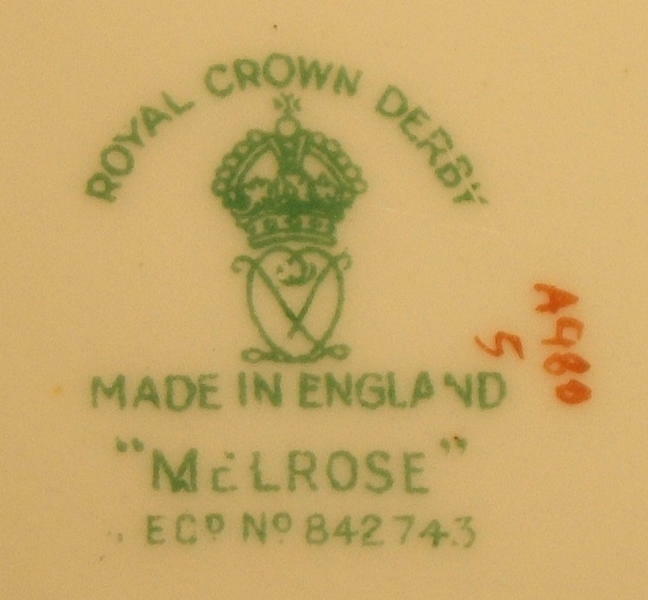 Royal Crown Derby® provided a replacement service during most of the period, so earlier patterns were reproduced so as to complete a set where a piece had been broken, but with an up-to-date factory mark. The piece in the image above in pattern 4550 (designed well before 1927) with date cipher for 1964 (possibly 1965) is perhaps an example of this. 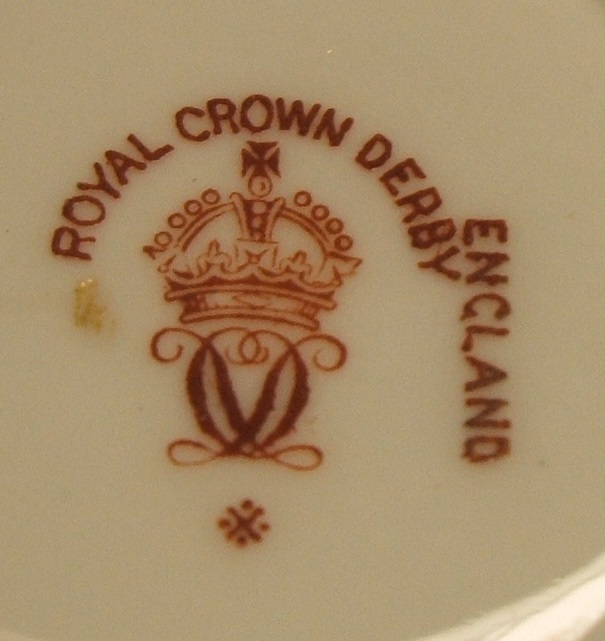 The above table conforms with the table on the Royal Crown Derby® website but there appears to be a discrepancy with regard to the placing of the "dot" in the case of the arrow for 1932. 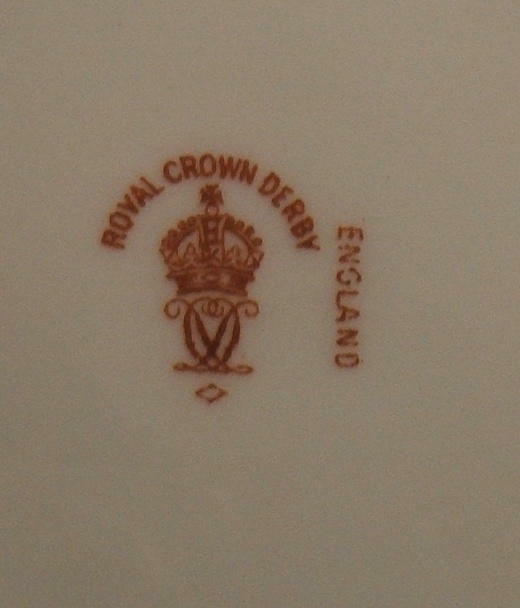 In the table produced by Ian Harding (page 121 "Cracking the Code" Derby Porcelain International Society 2009) the "dot" is placed to the left of the arrow and below are three examples. The dots in the 1932-35 ciphers appear to have been placed somewhat randomly which makes it difficult to date a piece with a downward arrow cipher with total confidence. From 1938 Roman Numerals were used to indicate the year of manufacture and these are set out below. Unfortunately not all pieces are marked with a cipher. The patterns were listed in the pattern books chronologically, so it is possible to give a date range, especially where the date the pattern was first produced is known from other records - e.g. "Vine" 1941. It is also hoped to give an approximate date when the production of a pattern ended in due course from a study of images available on internet auction sites. ** The "Ms" are interlinked. 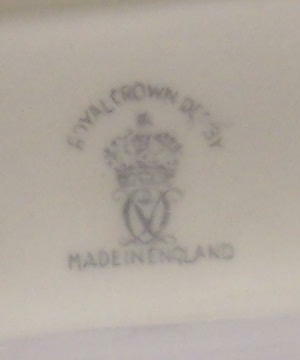 The first image above shows a factory mark from the King Street works, the production of which is not included in this site. However the King Street Factory was taken over in 1935, and there would have been a period during which both factory mark styles were used. 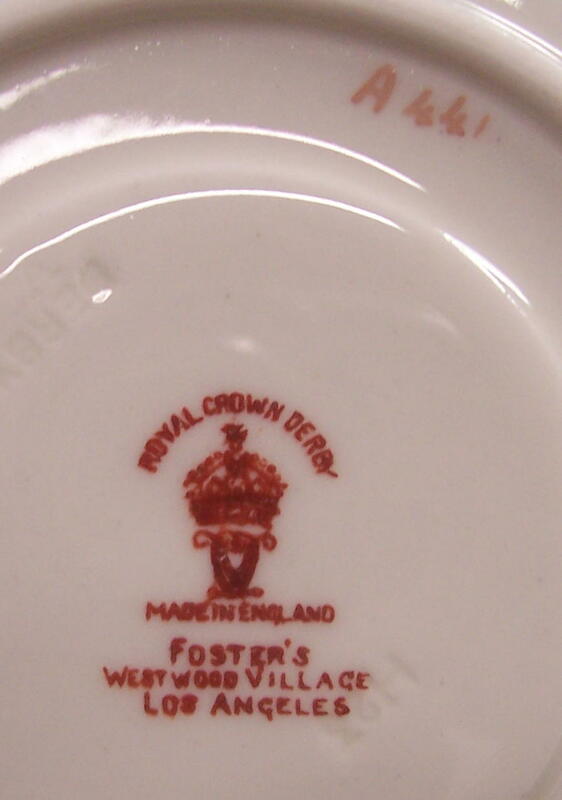 The second image shows an Osmaston Road factory mark on a coffee cup and saucer also in pattern number A67. The first two factory marks are scratched through. This denotes "Seconds" quality and is very often "overlooked" by internet sellers. Other marks indicating seconds quality include I.M.P.S (perhaps this stands for "imperfections") and the "BOW" over stamp. 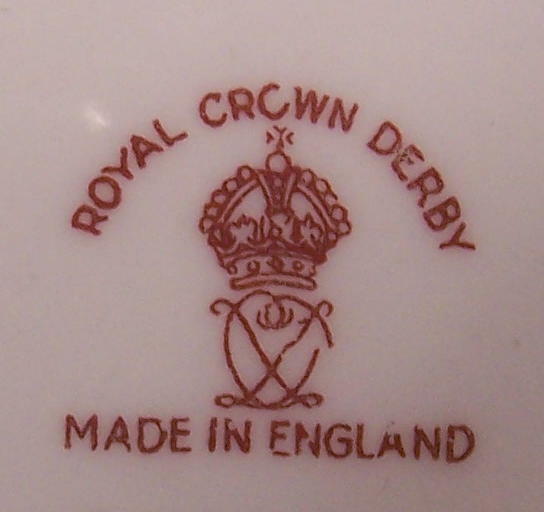 As much of the output up to, during and in the first seven years after the war was produced for export, only seconds quality or undecorated surrey shape ware was available to purchase in the UK. The I.M.P.S. and "BOW" marks show that it is perfectly possible to revise a factory mark after the initial firing, but the colour is unlikely to be an exact match as shown by the different shade of green in the I.M.P.S. example above. See also the "Dirigo Inc Chicago" and "Neiman Marcus" examples below. 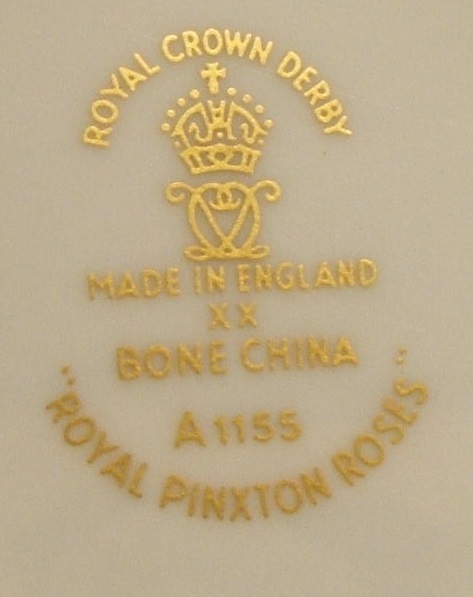 Some of the factory marks include registration numbers. These are an indication of the date a pattern is first registered, but the actual piece could have been made some time afterwards. The years and registration numbers are set out in the table below. Impressed marks can be useful, the numbers indicating the month and year the body of a piece was made or "potted". Usually the word "DERBY" is included but sometimes only the date cipher is impressed. Unfortunately a piece could have been potted and then stored away for years before actually being decorated. They were used somewhat sporadically during the period under question, and then on flat ware but not on hollow ware (i.e.cups, vases etc.). 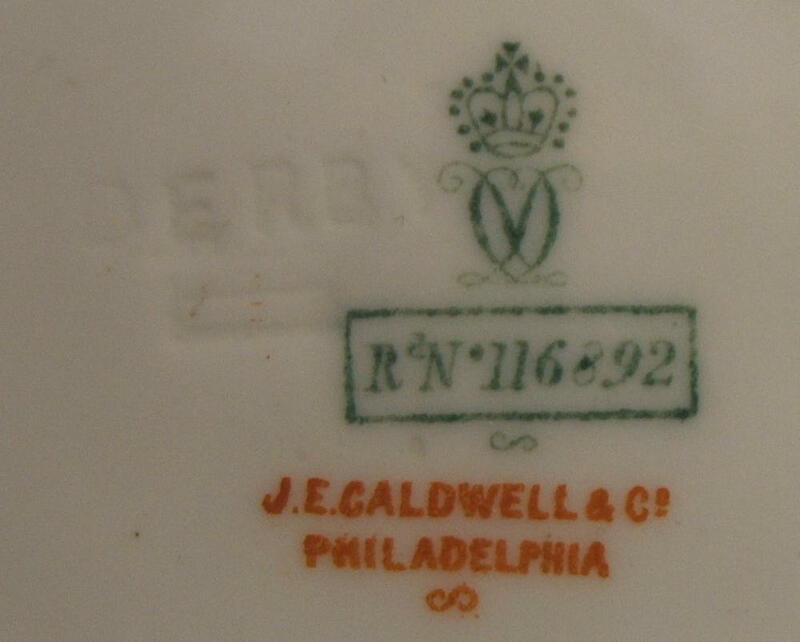 The impressed marks are often difficult to read, being underglaze, and can therefore be rather misleading. 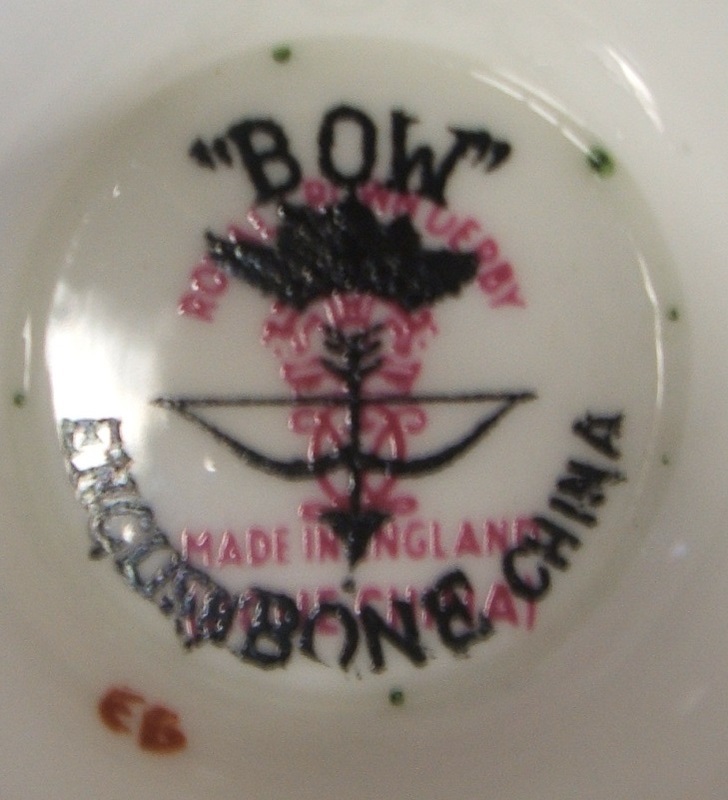 The green factory mark above appears on ware produced during the 1939-45 wartime period. 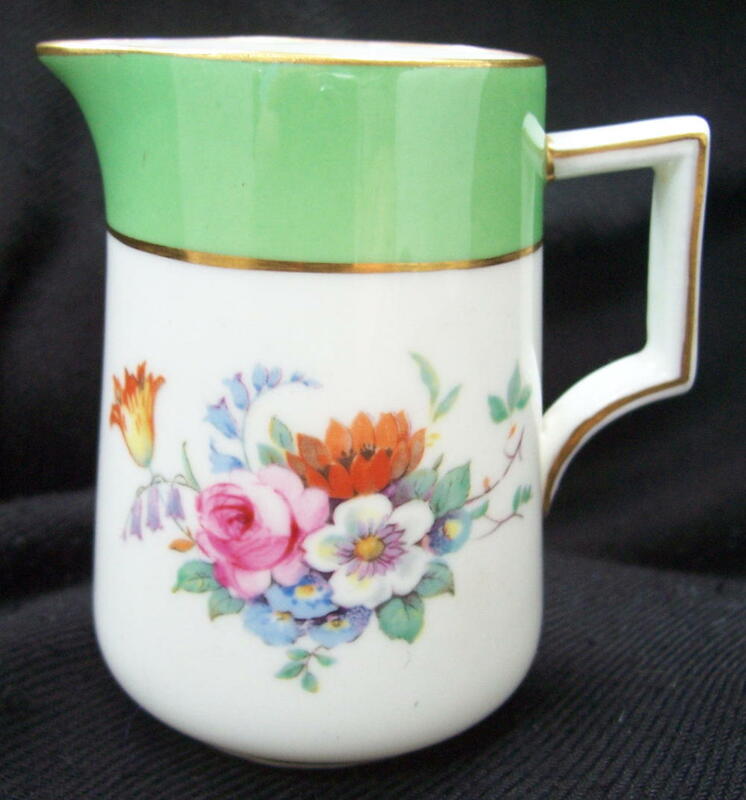 It can be seen on undecorated ware, and on pieces acquired as blanks and then decorated elsewhere (See "Decorated by Others") It also appears on patterns A228 (Posie), A420, A603 Glenmont (The entirely hand painted version), A713 Red Maple, A814 Medway, A941 Wentworth, A943 (Wentworth Variant) and A999 Melody. All the ware is in the "Surrey" shape and there is no date cipher. The pink version factory mark mostly appears to be confined to patterns A1018 - A1059 all being in the "Elizabeth" shape and probably produced in the immediate post war period. I have also have a dinner plate in the silver shape with pattern A1120 Pinxton Roses. 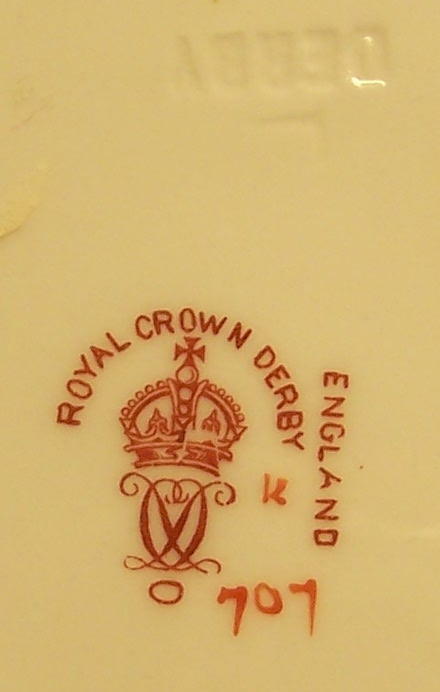 Again there is no date cipher but a similar mark appears on the limited edition Coronation loving cups and trays dated 1953, so it was probably used between 1942-53. Many of the items in the A1018 - A1059 pattern range have been acquired from the US and were most probably intended for export, as the Board of Trade restrictions on production for the home market were not lifted until 1952. 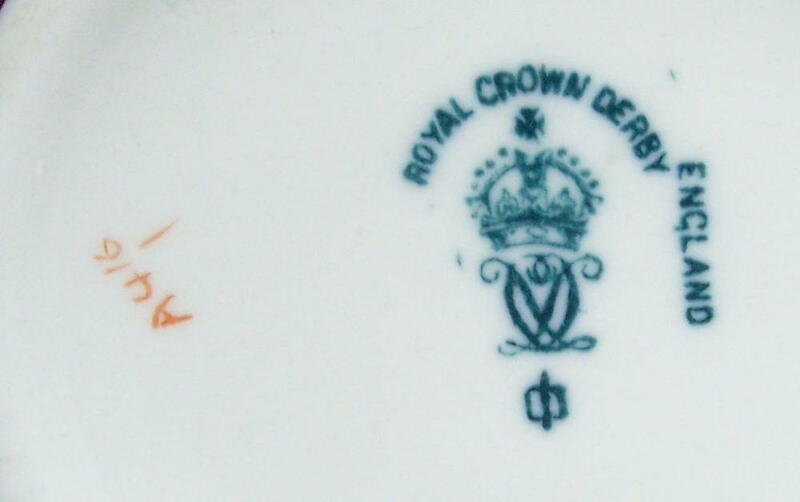 Plate in the Dragon pattern 9684 with date cipher for 1928. "Made for Lawleys" has been added over glaze. "Mr Lawley was a highly successful businessman and philanthropist renowned for his chain of china and glassware shops, Lawley’s of Regent Street". (See http://www.edgarelawleyfoundation.org.uk/). 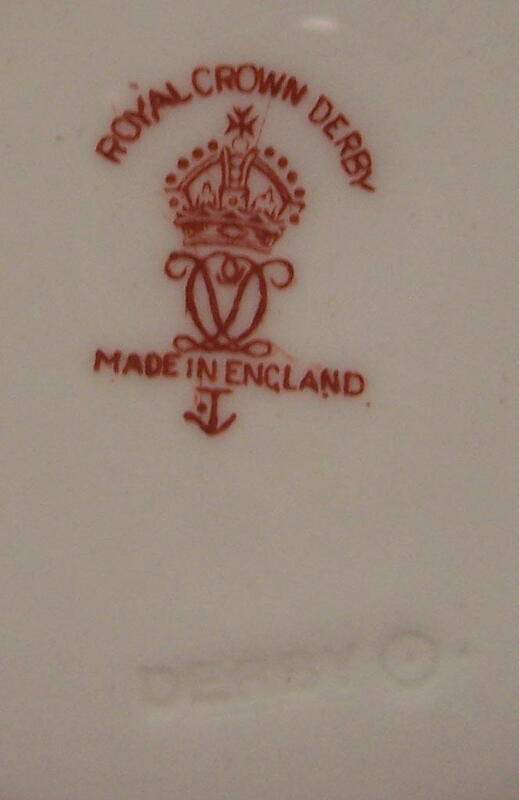 In 1940 Lawleys began acquiring potteries and by 1948 The Lawley Group owned 7 potteries and three subsidiaries. 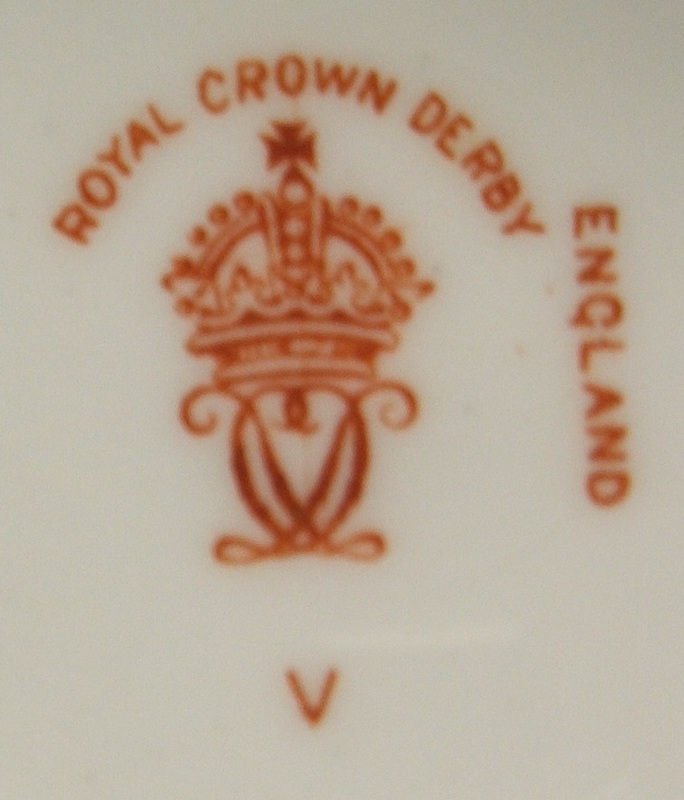 It eventually acquired Royal Crown Derby in 1963, with change of name to Allied English Potteries in 1964. (See https://www.gracesguide.co.uk/Lawley_Group). 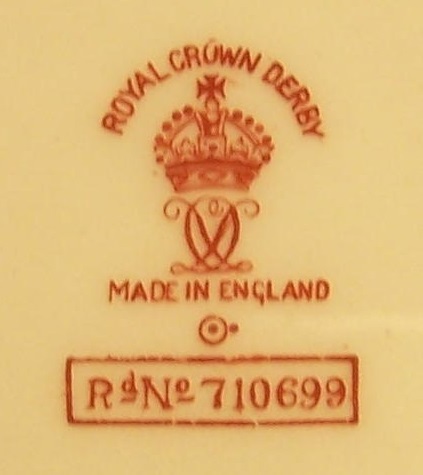 There would have been some reluctance to include retailers' information under the factory mark - This involved the expense of producing engraved copper sheets to produce a totally underglaze mark which would not have been justified for small orders. It could also be argued that it detracted from the factory mark being detrimental to what would now be called "brand awareness". This probably accounts for the rather lacklustre effort above, and the "Dirigo Inc" and "Neiman Marcus" marks below. 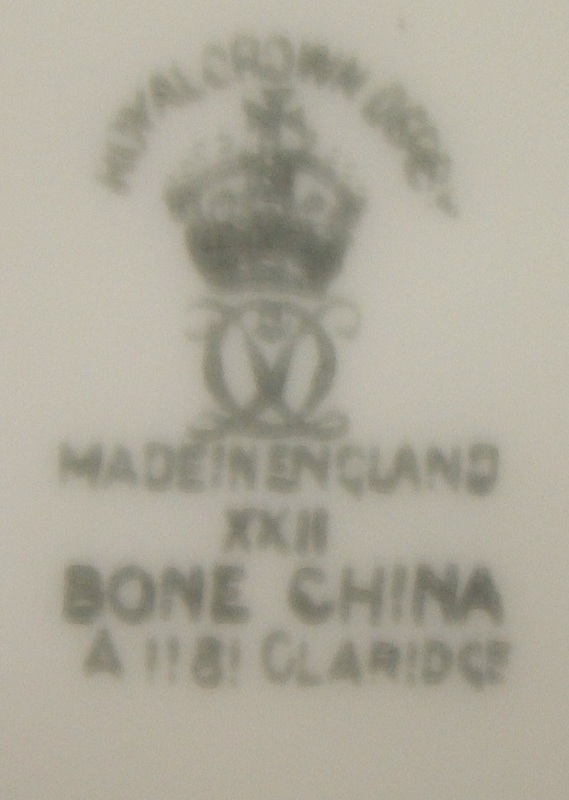 Above is a selection of factory marks which appear on pieces made for export. Mostly the stores are based in the United States, but a mark for "Hardy Bros.Ltd. Australia" is also included. I have also seen one for "Ovingtons New York"
In about 1941 the name of the pattern begins to appear on the factory mark and these are set out above in pattern order with "Balmoral", "Leroy" and "Matlock" amongst the first. 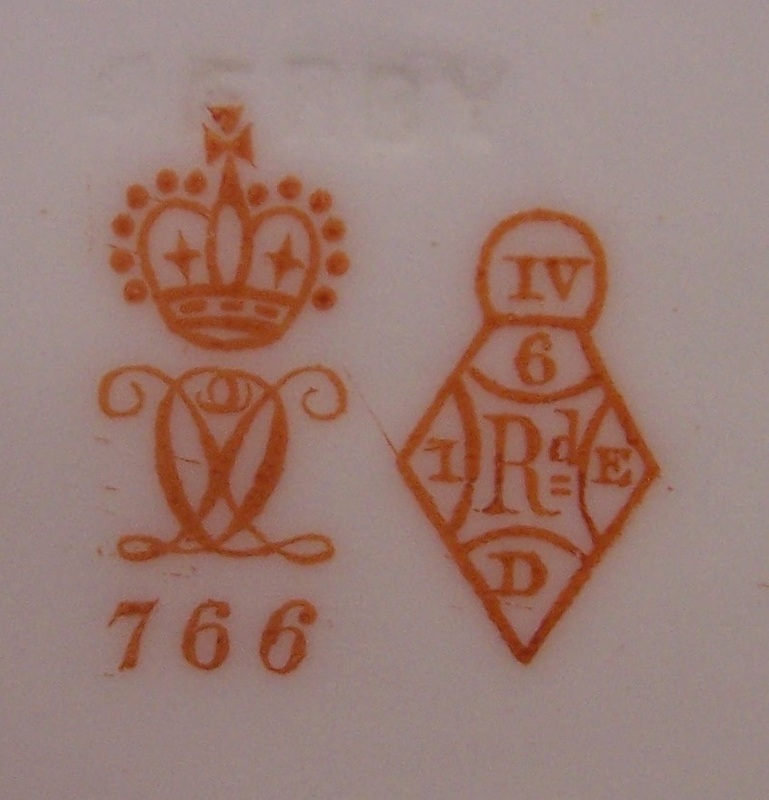 Early marks during the period were printed, and these are occasionally smudged as the pieces were worked on by the enamellers before firing. Latterly marks appear to have been applied as lithos with initially the pattern number being painted or printed on separately. In such cases the date cipher may be missing or added separately, sometimes well away from the mark. It should be appreciated that inevitably mistakes were made. 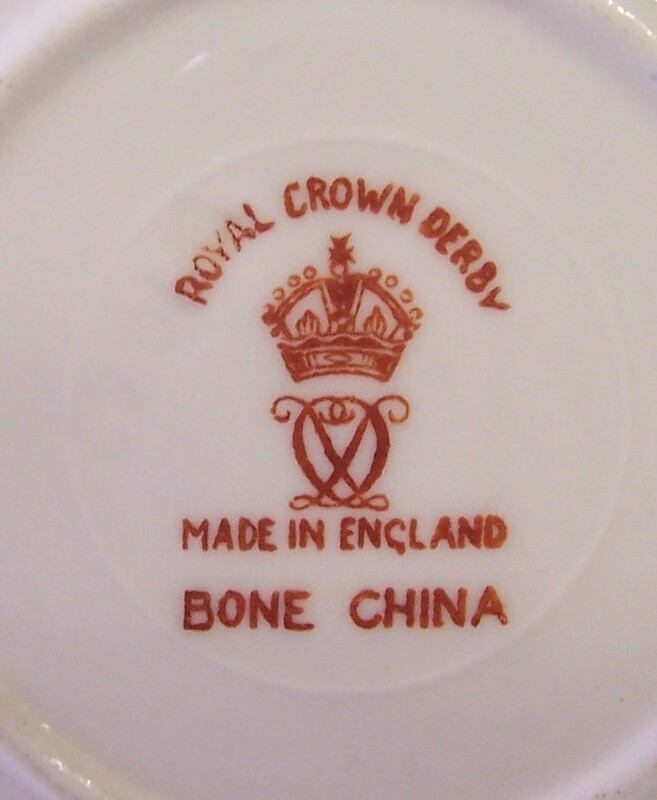 I have examples of a "Chinese Birds" tray marked "Pershore" and a Royal St James plate marked "Normandie". I also have a number of examples where a piece has been marked with an incorrect pattern number. With a multiplicity of ground colours in use, (of which some at first glance seem quite similar), and with discrepancies with regard to allocation of pattern numbers, it is hardly surprising that errors occurred. The factory marks to the demitasse cups are sometimes divided to fit. 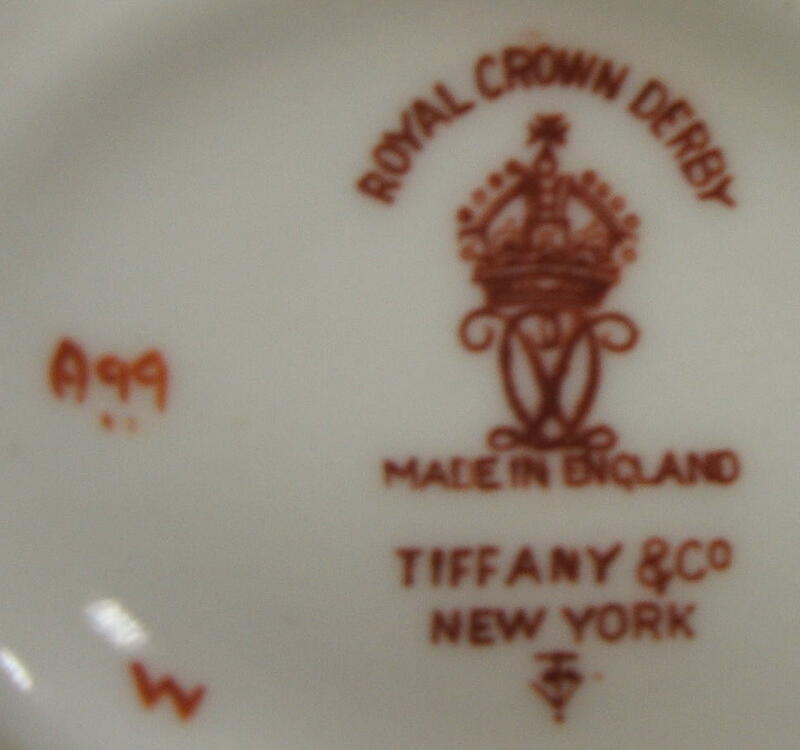 On the floral pieces and very small figurines only the words "Crown Derby" may appear. 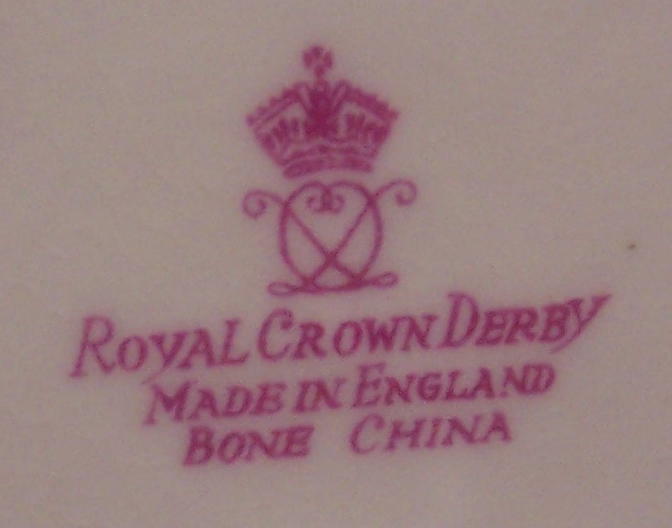 In the case of cutlery the knives (including butter knives) are usually etched with the factory mark or with the words "Royal Crown Derby" but are undated. Spoons and Forks and other smaller items are generally not marked although there are rare cases where the ceramic handles are marked on the reverse. 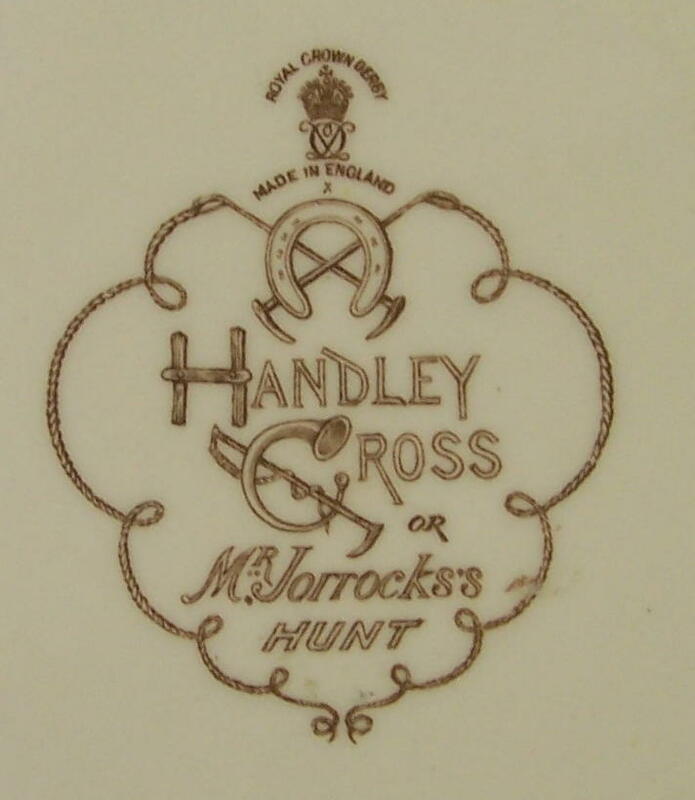 The "Handley Cross" mark appears on the Jorrocks series of plates. The date cipher (here "X" for 1947) is just above the horseshoe. 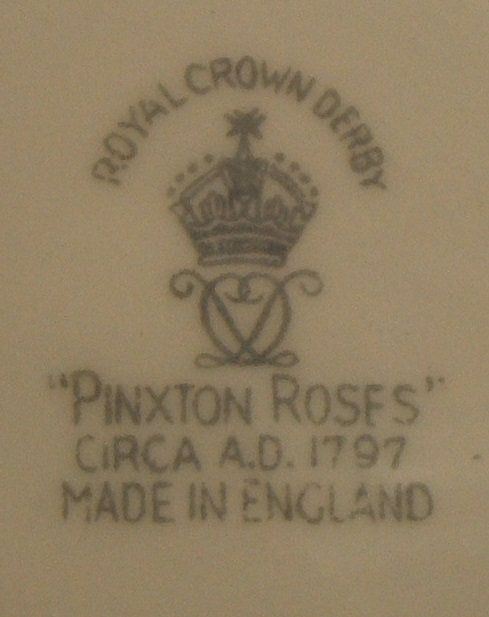 The second image shows a factory mark from the "PR" (Phillip Robinson) series of figurines (See under Figurines section). Unfortunately the pattern numbers are not always as readily legible as the example given for A173 above and are often misread as a consequence! 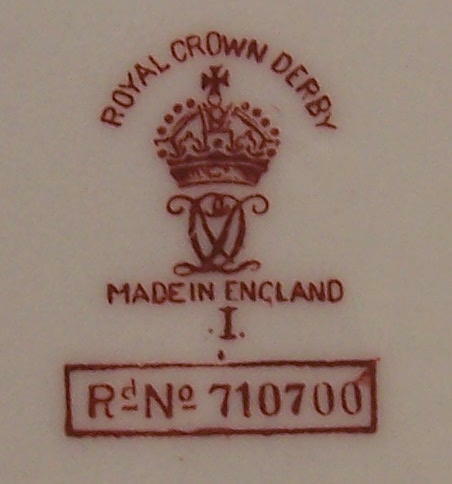 The "1800" shown in the fourth factory mark above is the shape number. The 0/1004 is understood from information provided by a former enamel kiln firer to show that it was a trial item number 0 of 1004 and that such pieces were "fired at all different levels and temps to ascertain the best positions for quality finishes". The two dots underneath are the identification mark for gilder Betty Bailey (Later Betty Wherry). Certain fancy items, especially vases, are marked with both a pattern and shape number e.g. 9956/1375 above. Other base markings include titles (e.g. Dean, Price, Hague and Birbeck Plates etc.) and gilders and enamellers' marks. I hope to produce a list of marks as more information is made available - see the blog page on Constance Clark - but if anyone can supply information they would care to share then it will make it possible to attribute pieces to specific individuals and give them full credit for their work. One note of caution. The gilders and enamellers marks were sometimes passed on to new staff and therefore reused. They therefore need to be checked against the dates during which a gilder or enameller is known to have actually worked at the factory. Unusual factory mark with cipher for 1949 and with apparent reference to George VI. 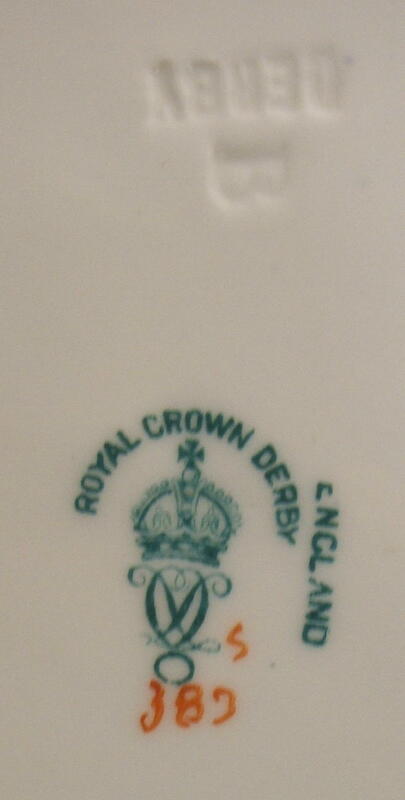 Seen on bowls with Diana pattern. The different shades of red suggests that the mark has been revised, perhaps with the intention to deceive. Further research required.